Calathea makoyana (Peacock Plant) is beautiful inside out! 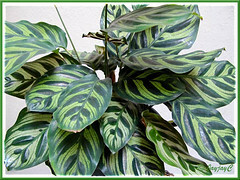 Undoubtedly, the foliage of Calathea makoyana is striking and beautiful to say the least, giving it the accolade of being called the Peacock Plant or Cathedral Windows! Haha, it itself seems to know that for a fact too! From morning to late afternoon on bright sunny days, it will show off its lovely light green leaves that are marvelously marked and trimmed with bold and dark green blotches and lines. 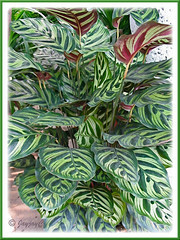 Calathea makoyana is a hot favourite amongst foliage lovers worldwide because of its exquisitely colored and patterned leaves. A decorative plant that is most ideal as a potted specimen, both indoors as a houseplant or outdoors at garden porches, decks, etc., as well as grounded in garden beds or borders at shady sites. This lovely plant has been a new addition to our tropical garden since October 30th. Just couldn’t resist it at a garden nursery nearby that sells a small pot for RM12. Fairly expensive when compared to plants sold in Sungai Buloh which may be only RM7, but one has to buy lots of plants per visit there, otherwise traveling about 100 km from home and back, incurring petrol expenses isn’t a bright idea. 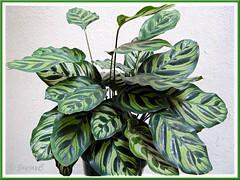 Features: Calathea makoyana is an exquisite species of the genus Calathea that comprises of about 25 species and hundreds of subspecies, cultivars, varieties and hybrids. An evergreen herbaceous perennial that can reach 120 cm tall in the wild, though typically grows between 45-75 cm in gardens and with an equal spread. It is a clump-forming plant with an upright habit and moderate growth rate. 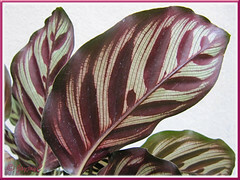 Peacock Plant is greatly admired for its distinctive coloured patterns and variegated foliage. 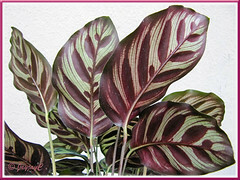 Glossy and leathery leaves are broadly ovate to oblong, 10-20 cm long, simple and margin, slightly wavy. They are attractively marked on both sides of its leaves, like artwork. Top base is light green with bold and darker green blotches, venation and edging, whilst on the undersides, it’s marked in maroon or reddish-purple tones. Blades are held on dark green petioles that emerge from the crown, are stiff and of varying lengths, giving it a multi-level look. Like many species of the Marantaceae family, Calathea makoyana has the characteristic feature of folding up their leaves by means of a tiny joint in the leaf stalk, at dusk or on cloudy days, like hands held upright in prayer. It does bear white flowers that are small and inconspicuous, though rarely produced in cultivation. Culture (Care): Cathedral Windows or Peacock Plant is quite an easy foliage plant to grow and maintain. Grows best if you can mimic the conditions of the tropical rain forest where it originated, with sufficient water (preferably rain water), heat (no direct sunlight, though) and high humidity. Light: Bright indirect light or filtered sunlight to partial shade is preferred for best growth and leaf colour, though tolerates low light or full shade. Avoid direct sunlight that will scorch the leaves. Moisture: Water moderately and regularly. Overwatering can cause root rot and eventually kill the plant. At lower temperatures, water sparingly and allow soil surface to dry slightly between watering. Provide adequate humidity to prevent browning of leaf margins, by either misting the plant regularly or stand potted houseplant in a saucer of pebbles filled with water almost to the base of pot. Soil: Fertile humus soil with a mix of sand that can retain water, yet porous. Others: Remove burnt or spent leaves and flowers. Re-pot only when it is overcrowded or the need to propagate arises as it likes to be pot-bound. Feed once monthly during the growing season with a general liquid houseplant fertilizer at reduced strength, on the soil but never on the foliage. It is sensitive to salt accumulation from unabsorbed fertilizer salts that will cause leaf margins to be ‘crispy’ or curled, so flush the soil occasionally with water to neutralize it. Avoid draughts or excessive wind that can cause curling of leaves. Brown edges on leaves indicate that the air is too dry, so mist regularly or use humidifiers or pebble trays to maintain high humidity. Check for spider mites, mealy bugs and caterpillars. For subtropical regions: Hardiness: USDA Zone 10a-11. Water well in summer and maintain high humidity by misting as best as you can. Brown tips is a sign of insufficient humidity. Provide bright light at all seasons, but avoid direct sunlight that will scorch the foliage. Water and feed sparingly in winter. Repot in late spring when the plant is pot-bound. Propagation: Easily propagated by dividing the root ball. Carefully separate the plants, ensuring that each division has a few leaves and strong roots intact. Pot each division individually in a good potting medium and firm the soil around the roots. Wet soil thoroughly, drain and site at a shady spot, misting regularly during the early stages to ensure success. Usage: Beautiful decorative foliage plant that is most ideal as a container plant, located indoors as a houseplant in homes or offices, and outdoors in the garden, porch, deck, patio, etc. Suitable in mix planters as fillers beneath taller plants. Excellent too, when ground-grown in garden beds or borders with a crowd of other foliage plants as outdoor fillers or groundcovers, under large shady trees. 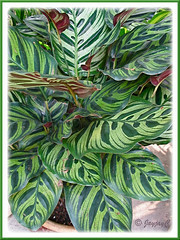 Attractive foliage plant that will look great in front of a shrub border as well. Can be used in bottle garden or terrarium. One of the beautiful plants which I always admire. I had once managed to rescue this plant when found it in uprooted and thrown out. But it didn’t survive as it was left too long on the roadside and the the plant didn’t recuperate. They seemed to have balls attached to the roots, I guess you would notice this when dividing them. Im sure you would truly enjoy this plant. Jean – lovely to meet you here. It’ll definitely be a wonderful addition to your list of houseplants. Appreciate your visit and thanks. James – you’re right, I’m sure gonna love it! Like you, I’ve been admiring it for quite some while since I first saw it at a garden nursery last February but it cost a whooping sum of RM45 for a pot of almost 2′ tall matured plants. Of course, I’d rather get young plants and they cost so much less. I don’t intend to divide them as yet since I’ve learnt that they prefer to be pot-bound. Moreover, I’m seeing more new shoots emerging and think best to leave them happily undisturbed. Thanks for visiting, James..I do appreciate your support. i have bought this plant 1 month ago but unfortunately the leaves are slowly turning brown! i have try watering moderately and keep in shade. Is fertilizer could be the cause? Hi Malar! 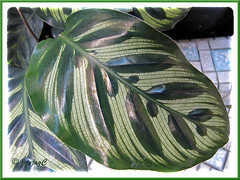 What we know is Calatheas in general need high humidity, so misting on their leaves regularly is recommended to prevent browning of the leaf margins. Also, never use fertilizers on the foliage, apply directly on soil instead. Hope this helps. Thanks Jacqueline! I will try ur advice! hi jacqueline! I come from China ! 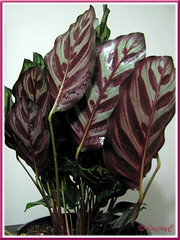 I see the Calatheas is very beautiful, and I want to get it a lot . Do you know where can buy? A really lovely plant. The larger ones used to be rare and expensive but prices are coming down, smaller ones are sold quite widely now. This species looks wonderful if you can display it elevated to eye level – mine are on a sheltered wall, with diffused light behind them in the afternoons / evenings. The inner structure of the backlit leaves is endlessly fascinating, and they truly deserve the nickname “cathedral windows”. 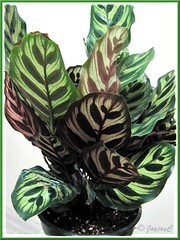 One of the more sun-sensitive Calatheas, so should have no rays on its shoulders. Does best, like most of its genus, in soil that is rich yet drains well. My potting mix is black organic soil mixed with slightly loamier soil, amended with smaller amounts of coir, large river sand and fully-dried, minced bark and twigs. This keeps a light, springy texture – any soil that packs down and becomes heavy risks rot damage to the roots. As rightly noted above, they do like being moderately pot-bound and I will not disturb mine until the plant is noticeably losing growth rate and roots are breaking though the topsoil. Then it’s usually out with the hammer and ten minutes later I have more pot shards and a freed rootball! They transplant surprisingly well but should not be moved too often. Hi Lifera! Your informative sharing of this beautiful plant speaks volume of your passion in gardening. Thanks for all the much appreciated extra tips about its care. It’s always so encouraging when people like you take the trouble to share their expertise for the benefit of others. You’re most welcome, Mohsen! We love sharing.